We offer dry chili pepper products (Capsicum) for wholesale. At Magic Plant, we grow, process, pack, and then distribute pepper products. In addition, we provide dry Chili Pepper powder, Chili Pepper pods, Chili Pepper flakes, and Chili Pepper mash worldwide. Chili Pepper products are packaged in “ready for retail” packaging and also bulk. In addition, we provide a “contract growing” program for larger customers. This unique program includes first growing your specific variety(s). Secondly, we process the ripe peppers to your specifications. Lastly, we ship the final item to you. Contact us to learn more about this program. Those interested can also read more about our “contract grow” program here. Additionally, we offer customization/private label services. Finally, we also customize packaging to suit your needs. Please ask us about this. Dry chili peppers are rich in Vitamins A, C, Potassium, Magnesium, Iron and Capsaicin. Capsaicin releases Endorphins, reduces inflammation, clears congestion, lowers blood sugar levels, and reduces cholesterol. There are also many other health benefits. In 2007, the Guinness Book of World Records named the Ghost Pepper the hottest chili pepper in the world. Ghost Chili peppers rank at approximately 1,000,000 SHU (Scoville Heat Units). By the same token, jalapenos are only rated at 5,000 SHU. Meanwhile, Habaneros rank around 100,000 SHU. The ghost dry chili pepper pods are dried whole. We then smoke them which gives them a great taste! However, a little goes a long way to spice up your foods. No doubt they are also great for showing your friends how tough you are! Each bag contains 13-16 dried, whole smoked peppers (approx 0.5 oz.). Add Ghost Pepper pods to your dishes. Rehydrate dried pods and add to recipes. Also, use them to add flavor to stews, chili beans, chicken, pizza, Salsas, soups, and more. 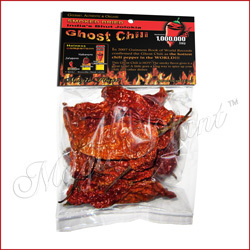 Buy Ghost Pepper dry pods retail and wholesale. Each Ghost Chili powder comes in plastic storage container. Weight is 0.5 oz. 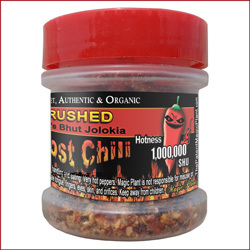 The great flavor of our ghost chilies makes your dishes taste divine. Buy Ghost Pepper powder retail and also wholesale. Each Ghost Chili flakes / crushed comes in plastic storage container. Weight is 0.5 oz. 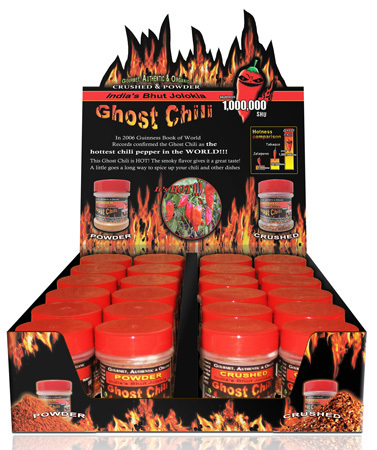 The great flavor of our ghost chilies makes your dishes taste divine. 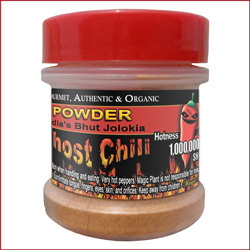 Buy Ghost Pepper powder retail and wholesale. The dried Trinidad Scorpion Pepper has an AMAZING hot flavor! A flavor so hot, in fact, it will kick your tongue. In 2011, Guinness Book of World Records confirmed the Trinidad as the hottest chili pepper in the world! WOW, IT’S SO HOOOOT!!! Additionally the Trinidad Scorpion pepper tastes great in many forms. It tastes good raw, cooked, pickled, as well as when added to salsas. Cook with it if you dare! Actually, you can brew up your own scorpion hot sauce to give to your friends. In fact, save some for your enemies! 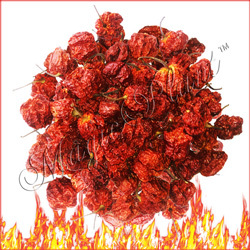 Buy Trinidad Scorpion dry chili pepper pods retail and wholesale. Each Scorpion pepper powder comes in plastic storage container. Buy Trinidad Scorpion pepper powder retail and wholesale. Each Scorpion pepper crushed / flakes comes in plastic storage container. Buy Trinidad Scorpion pepper flakes retail and wholesale. In 2012, scientists identified the Trinidad Moruga Scorpion as the hottest chili pepper in the world. Of course, most Trinidad Moruga Scorpion peppers have a heat ranking of 1,200,000-2,000,000 Scoville Heat Units. And that’s hot enough for some! The golf-ball-sized pepper is native to the district of Moruga in Trinidad and Tobago. The Trinidad Moruga is hot, but on the other hand, it is also fruity. No doubt the pepper is hot but the undertones of citrus, cinnamon, and strawberry provide great flavor. Consequently, this sweet-superhot combination offers a taste adventure. As a matter of fact, it makes for yummy hot sauce, salsa and more! 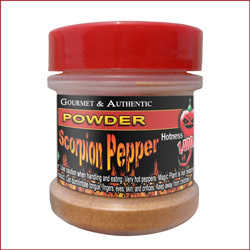 Our Trinidad Moruga Scorpion powder products come packaged in a plastic spice jar. The jar has a quality sealed sifter lid. Bottled and ready for retail. 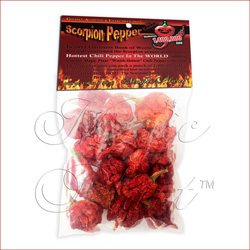 Buy Moruga Scorpion dry chili pepper pods retail and wholesale. Each Trinidad Moruga Scorpion powder comes in plastic storage container. 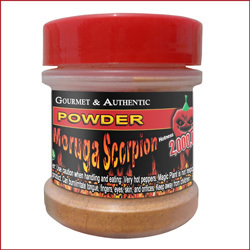 Buy Moruga Scorpion pepper powder retail and wholesale. Each Trinidad Moruga Scorpion pepper flakes comes in plastic storage container. Buy Moruga Scorpion pepper flakes retail and wholesale. Carolina Reaper (Capsicum chinense) is the hottest pepper in the world. They average a heat level of 1,400,000 SHU. Strangely enough, even though the Carolina Reaper is hot it also tastes fruity. Wrinkled in appearance, the shape of the Carolina Reaper is like the peppers in the Trinidad Scorpion family. At the same time, Carolina Reaper peppers are long season peppers like many of the other super hot peppers. We grow Carolina Reaper plants in several different geographic locales. Ultimately, this is to diversify the crop and also ensure stock year-round. First, we dry Reaper pods. Then we grind them into powder or flakes. In addition, we also provide the whole dried pods. We believe our peppers are hotter because of the geographical locales they grow in. Spice jars come with quality-sealed sifter lids – Ready For Retail. Buy Carolina Reaper dry chili pepper pods retail and wholesale. Each Carolina Reaper powder comes in plastic storage container. 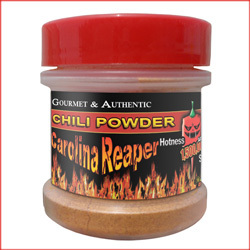 Buy Carolina Reaper pepper powder retail and wholesale. Trinidad Carolina Reaper Flakes come in a plastic storage container. Buy Carolina Reaper pepper flakes retail and also wholesale. The Scotch Bonnet Pepper is grown mostly on the island of Jamaica. It is actually a sweet but spicy pepper. Add it to your foods for a unique Caribbean flavor. Additionally, it makes a tasty hot sauce! Most Scotch Bonnets range between 100,000-350,000 Scoville Heat Units. Also, the Scotch Bonnet has a stout shape. Boabs Bonnet, Scotty Bons, Bonney Peppers, Ball of Fire, or Caribbean Red pepper are also names for this pepper. Each Scotch Bonnet powder product comes in a plastic storage container. 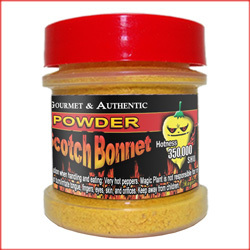 Buy Scotch Bonnet pepper powder retail and wholesale. Each Scotch Bonnet Crushed / Flakes comes in plastic storage container. Buy Scotch Bonnet pepper flakes retail and also wholesale. Another pepper cultivated in Jamaica is the Scotch Bonnet Pepper. Ultimately this Scotch Bonnet adds Caribbean flavor to foods. In addition to its sweet/hot flavor, it also makes a colorful hot sauce. Similarly, to other Scotch Bonnets, the yellow varieties also have a heat rating of 100,000-350,000 Scoville Heat Units. Additionally, the Scotch Bonnet goes by other names too. For instance, it is also known as the Boabs Bonnet, Scotty Bons, Bonney Peppers, the Ball of Fire, and finally, the Caribbean Red pepper. 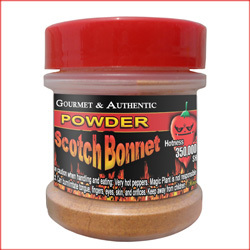 Scotch Bonnet powder comes in a convenient plastic storage container. 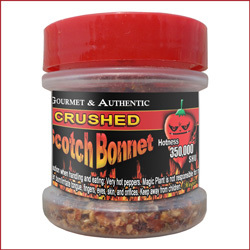 Buy Scotch Bonnet pepper flakes retail and wholesale. Many people enjoy the heat of the Habanero dry chili pepper. In addition, they enjoy the fruity, citrus-like flavor and also the floral aroma. As a result, the Habanero is one of the most popular ingredients in hot sauces and spicy foods. In 2000, Habaneros were confirmed to be the hottest chili pepper in the world. However, it was dethroned later by hotter peppers. Habanero chilies rank from 100,000–350,000 on the Scoville scale. In addition, it is considered to be one of the oldest South American chili peppers in the world. In fact, Habaneros originated 8,500 years ago in the Amazon in South America. Interestingly, Habanero remains have been found in Guitarrero cave in the Peruvian highlands. In addition, remains date back to the Preceramic period (1,800 to 9,500 BC). Incidentally, this is also the first evidence of human occupation in the highlands of Peru and consisted of groups of hunter gatherers. Furthermore, Habanero remains have also been found in archaeological digs in Mexico. Each Habanero pepper powder comes in plastic storage container. Buy Habanero pepper powder retail and also wholesale. Each Habanero chili Crushed / Flakes comes in plastic storage container. Buy Habanero pepper flakes retail and wholesale.